What Is Meditation? Many people have a uninformed view of meditation and wonder, “What is meditation and what good can it do me?” While some people may have visions of monks in far off lands sitting together in silence when they think about meditation. Meditation is actually becoming a practice that is quite popular in the Western world among people from all walks of life. If you are not familiar with meditation, you may still be wondering, “What is meditation?” Essentially, the answer to the question is a simple one. Meditation is an approach that anyone can use to help them cope with medical problems, stress, and anxiety by way of thought, contemplation, and reflection. Meditation encompasses a variety of practices that are somewhat different, while holding to the basic principles of consideration and quiet thought to bring about a state of rumination. Various types of meditation that are recognized include transcendental meditation, prayer, Zen meditation, Taoist meditation, mindfulness meditation, and Buddhist meditation. Some methods of meditation may require the body being absolutely still or to be moved with controlled deliberation, while other types allow for free movement of the body. While the methods are different, the end goal of all types of meditation lead to a mind that is quieted and free from stress by the use of quiet contemplation and reflection. Related meditation Articles:history of meditationwhere did meditation originatelearn meditationbrain waves in meditationhow does meditation workmeditation researchmeditation statisticsAlong with the question “What is Meditation,” you may also wonder, “What benefits can be experienced by using meditation regularly?” There are a variety of benefits that have been linked with the regular practice of meditation. Meditation can bring about healing of both the body and the mind by using deliberation of thought and consideration. There are various physical benefits that can be experienced when meditation is made to be a part of daily life. Some physical benefits of meditation include a decrease in blood pressure and an improvement in breathing due to the increase of air flow that gets to the lungs. Those who use meditation regularly also find that their resting heart rate is lower as well, which takes some of the stress off the heart. Chemicals in the body that are associated with stress are lower as well, which leads to less anxiety. Meditation also promotes youthful skin and a youthful appearance. Meditation is a practice that brings about not only physical benefits, but psychological benefits as well. Bringing oneself to a state of rumination through meditation has amazing effects on the psych of a person. Relaxation and a decrease in stress are rather obvious benefits, but many people do not realize that meditation can also improve moods and memory and decrease moodiness and depression. How To MeditateIf you lead anything even close to a normal life, things are no doubt pretty hectic for you on a daily basis. Between working, the children, and your social life, it is easy for stress levels to get pretty high, and this is okay for a short period of time. Stress is a natural response to things that are occurring in your environment. It is your body's way of telling you that you have something in your life that needs to be taken care of. Sometimes, stress can get the best of you and that is when it is important to find a way to cope with your stress before it starts to mess with your life. Creating a peaceful atmosphere is a critical and one of the most essential components of your meditation experience. Do whatever it takes to create as calm an atmosphere as you can, through whatever measures possible. Pack the children off to the babysitter, tell your husband go play poker with his buddies, and make sure your phone is silenced. Turn down the lights low and if you want put on whatever music makes you feel serene and peaceful. Choose the type of music that creates a sense of calm in you. Music can set the mood for reflection and contemplation. Whilst you are creating your peaceful atmosphere, there may be certain “props” to help you meditate. It isn’t required that you have any, but yoga mats or cushions are great seating arenas for meditation or you may simply sit on a dining chair or easy chair. To put it frankly, if your rear end is killing you, you may not be able to focus as intensely on your meditation, cusions are very helpful. Also, things that help you relax are also good to have in your environment during your meditation. Many people like to have the small running water fountains as the sound of running water is very soothing; lighting the room with a few candles is also an effective way of ‘setting the mood’ for your meditation time. When it comes to your meditation, leave the stilettos and the diamonds at home please! Strangely, many people even choose to meditate in the buff, as it provides less of a distraction by the every day world. If you haven’t seriously given the idea of meditation your deliberation you should soon, while you can still save your sanity! Free Meditation DownloadsAlmost each one of us, who is inclined towards learning & practicing Meditation, passes through this debate of relying on the free meditation downloads versus paid guidance & material available only after paying a cost for it. • Are free meditation downloads worth downloading? • Can Meditation be learned by reading material available for free? Or does it require a practical real life teaching? • Is the material available free of charge authenticated, trust worthy & effective? • What is my learning style & pattern? Am I comfortable in reading the material found at no cost, understand the instruction & follow them thru by my self alone or would I need help from an instructor. • What are the budget constraints that I have & how much am I willing to pay for receiving such information? • Do I have the time & inclination to find the best available free material from the long list? • Does one have a substantial benefit over other? • Why do they make it available free of cost? Can it really be free? • What kind of meditation download is free & which requires paying a cost? Benefits Of Meditation: The benefits of meditation are endless and certainly deserve your contemplation and consideration. Many successful business people, celebrities and sports professionals practise and enjoy the benefits of meditation. Numerous businesses promote and provide help and assistance to their staff with the benefits of meditation courses and because of this they gain an advantage over their competitors and create more profit. Research has scientifically proven that meditation is a safe and simple way to balance your physical, emotional, and mental state and its countless values have been known and practiced for thousands of years. More and more doctors promote the benefits of meditation to cure many stress related illnesses. Everyday most of us experience stress in many different ways and I believe many people are simply not aware of the benefits of meditation or of how much stress we actually hold on to. Normally life threatening situations trigger off the stress response which enables us to act without contemplation and deliberation and survive intense situations using fast reflexes. When our bodies are exposed to a sudden threat we respond with the characteristic fight or flight reaction which is known as an adrenaline rush. When adrenaline and other hormones are released from the adrenal glands the pulse races, blood pressure increases, our breathing becomes faster and the blood flow to the muscles increases. If we are in extreme danger these reactions are of great assistance and gain to us. We have inherited this survival response from our ancestors who faced many life threatening situations every day. The same response is now triggered in our daily lives when we are in a traffic hold up or someone irritates us at work or we simply break a cup. If we do not confront the situation (and many are beyond our control) we end up being in a permanent state of stress. One of the most important benefits of meditation is how it releases stress from our bodies. Meditation practised regularly will lead you to a deeper level of relaxation and contemplation. If you want to be free of constant worry, pressure and stress the benefits of meditation can give you a life that is calm, peaceful, happy and relaxed. Meditation TechniquesMeditation has many benefits and anyone who has tried even a single meditation technique will swear by it. Everybody meditates to bring peace and serenity into their lives, to be one with their inner selves, to heal and to improve their mental and physical health. Thus, no matter what the reason for practicing it, meditation is universal. Now, although meditation is universal, meditation techniques may differ from one culture to another. Often different meditation techniques are suited to different personality types. Some techniques are expansive and allow for the free flow of thoughts and their observation whereas some types are concentrative that involve bringing focus into one's thoughts. Related meditation Articles:guided meditationzen meditationchakra meditationchristian meditationyoga meditationmeditation for childrengrounding meditationjapa meditationvipassana meditationsleep meditationbuddhist meditationfull moon meditationmindfulness meditationwalking meditationa> Mantra Meditation: The mantra meditation technique involves the conscious repetitions of certain sounds that appeal to the mind in order to achieve a meditative state. Mantra literally means ‘revealed sound’ or a combination of sounds that develop spontaneously. It is important not to confuse a mantra with religious chants. A mantra maybe given by a guru or may be a personally chosen sound or word, but the important thing is that it must appeal to the mind. b> Trataka Meditation: The Trataka meditation technique is one that has been followed by many religious systems, including Sufism and Christianity. In this, a steady gaze is performed on any one particular object. Trataka is an established yoga cleansing technique and dedicated practice of the same takes it to the highest level of meditation. c> Chakra Meditation: Chakras represent a higher level of energy manifestation and development of self. The meaning of the word ‘Chakra’ is a wheel. Each chakra represents the major nerve centers that branch off from the spinal cord, serving the major organs of the body. In all, there are seven chakras. The main aim of this meditation technique is to help individuals discover and explore their chakras, thereby awakening them on a conscious level in a balanced and integrated way. d> Vipassana Meditation: The word Vipassana means ‘insight’. It refers to the ability to see things as they really are, attained through a process of self-observation. It means identifying one’s own nature, recognizing the bad elements and consciously eliminating them from the system. Vipassana is a meditation technique that is free of rites, helps develop wisdom and allows an individual to study different sensations in the body such as cold, pain, itching, etc. e> Raja Yoga meditation: This form of meditation takes the yogi (person who practices meditation) through to a higher level of oneness and a greatly ennobling experience. It fills him with super-sensuous joy or bliss that elevates the mind away from pleasures of the flesh and reforms his bad habits. A Raja Yogi establishes a relationship with god and gives up all worldly pleasures and devotes all his energies to the spiritual awakening of fellow beings. According to me, both the option (free meditation download & paid downloads) have a distinct advantage & should be used according to the need of the person. One can use the free available online information as a base & material for research & broader understanding of the subject. In most cases, browsing & depending on free of cost information provides a person a general idea of what meditation is, benefits of practicing meditation, a generic guidelines of practicing it. One can get used to glossary of terminologies like difference between contemplation, reflection, rumination by simply referring to a couple of free sites. However, if after collecting information & knowledge about the subject, as one wants to progress deeper in knowledge & higher in experiencing meditation, on must rely on the paid services for effective results. For example, if one is a novice in field of meditation, he should first use “free meditation material” to get a flavor, general awareness & understanding of the subject. For a more seasoned player, free meditation downloads wouldn’t really be of much help. In such a case, free download might just complicate the matter by providing a contradictory view to an already known & practiced method. To answer these questions & get a clearer & deeper understanding on subject, one would require proper directions from experts of the field. At such a times, free downloads would not really help but add to the confusion of mind. If one is unable to analyze, correlate the various downloads, materials & available information, then he/she should turn to a paid service to get the confusion cleared. Also as one moves up the ladder, he requires a need of expert teacher or guide to walk with him on higher paths. As seen, the paid & free meditation downloads should not be seen as competing against each other, but be acknowledged as being complimentary to each other. Each has its “best-fit-situational use” & must be used appropriate to situation & need. happiness all naturally blossom in everyday life. the past, when the whole awareness comes to the present moment. Such beauty and fullness is found there! assists you towards perfect health, inner peace and happiness. incense and let the light of love shine clear in your heart. for your health and happiness, and for the spiritual evolution of mankind. words and deeds. The effort is towards attaining balance in the different facets of one’s personality. or in the people with whom we have to interact. The problems we face arise from within. meditation produces results that are permanent and abiding. gentleness, but without expectation or attachment. and practicing forgiveness and acceptance we begin to experience pure and perfect love. object. We can discover its ultimate truth and the ultimate truth of existence. human spirit and the Supreme Universal Spirit. We are One with the Universe. earn through the daily practice of meditation and experience it for our self. events out there in the real world will be the creation of peace, love and understanding. accept discomfort, slow down the mind, concentrate, and to cherish others with great compassion. mind and body), awareness, contemplation and concentration. peace and harmony out there in the real world. and the benefits are reduced. meditation and self awareness, and therefore require more time. attempted when the heart and mind are purified and untainted. i.e. by the preceding techniques. Always finish with these techniques to close the session. Yoga ClassesIn addition to practicing the poses, yoga classes may also include instruction on breathing, call and response chanting, meditation, or an inspirational reading by the teacher. The variety and amount of this will depend on the individual teacher and the yoga style in which he or she is trained. Typically, a yoga class at a gym will be more focused on the purely physical benefits of yoga, while one at a yoga center may delve more into the spiritual side. Some people find that the physical practice of yoga becomes a gateway into a spiritual exploration, while others just enjoy a wonderful low-impact workout that makes them feel great. Whatever your tendency, you will be able to find a yoga class that suits your style. music, all these and many more have their origins in prana. or absent, the astral body separates from the physical body resulting in death. have to tame this prana gradually. The techniques in this book are reasonably simple and do not require a lot of preparation. Precautions‘ section at the back of the book. of inhalation, retention and exhalation varies according to the strength and capacity of the practitioner. the practice of concentration and meditation. Pranayama 3 and 4 utilize the awareness of the movement and circulation of prana. energy revitalizing and strengthening your mind, body and spirit as it travels around your entire being. develops the virtue of persistence. Deep breathing and stretching up is the object of concentration. Take a few moments to find a comfortable and stable meditation position. If you can not sit cross legged on a cushion, then you may want to use a chair. Rest the hands in the lap or on the knees. Relax the body but always keep the spine and head straight, close the eyes. Feel as if the top of the head is being pulled up to the sky, keeping you perfectly straight. Relax the body. Relax the breathing. Relax the mind. Repeat the following technique 3 times. Be sure to completely fill the lower part of the lungs, middle and upper chest with air. As you breathe in, feel your whole being renewed with vitality and strength. As you breathe out, feel your whole being releasing negativity, distraction and disease. Do this 3 times, then rest and relax for a few moments. Now repeat the following technique 3 times. Straighten the arms upwards and join your hands above your head. Feel the healing energy rising up through your body, revitalizing your whole being. And mentally repeat the affirmation. When you have finished raising the arms three times, relax your body. Feel your breathing slowing down. Feel your whole being relaxed and refreshed. acceptance. Relaxing is the object of concentration. Sit quietly and comfortably with the eyes closed and the spine and head straight, but not tense. Mentally repeat and contemplate the affirmation 3 times. Then open the mouth about an inch and release the breath in a long, slow exhalation. Softly chant “ahhh…” for about 10 or 20 seconds. Use all the breath but do not strain. Close the mouth, breathe in deeply again through the nose. Hold the air in for a moment. Observe any feelings or sensations with a calm mind and without moving. Now begin to deeply relax the whole body. Relax the feet, relax the legs, and relax the hips. Relax the stomach muscles and feel the whole abdomen drop. Relax the chest, relax the shoulders, relax the arms, and relax the hands. Check your spine and head are straight, but not tense. Relax the face. Relax the whole body, relax the breathing. Allow the body, mind and spirit to become quiet, calm and refreshed. Keep still and do not react to any discomfort or distractions. the first month, increasing to twelve rounds in the second month. Raise the right hand to the face and hold the nose tip position. Gently rest the index and middle fingers on the forehead at the eyebrow centre. The thumb is next to the right nostril and the ring finger is next to the left nostril. nostril in turn. The little finger is completely relaxed. The left hand rests on the left knee with the fingers ready to count five rounds of this technique. Keep the head straight. Do not allow it to drop down during this technique. Smoothly and softly breathe in through the left nostril. Breathing should be quiet and gentle. As you breathe in start to count, in your mind, from 1 to 12. When you reach 12, try to have your lungs completely full, but without straining. Now close the left nostril with the ring finger, so that both nostrils are firmly closed. Hold your breath and count, in your mind, from 1 to 12. Keep the left nostril closed and open the right nostril with the thumb finger. Smoothly and softly breathe out through the right nostril. Breathing should be quiet and gentle. As you breathe out count, in your mind, from 1 to 12. When you reach 12, try to have your lungs completely empty, but without straining. Now smoothly and softly breathe in through the right nostril. Breathe quietly and gently. As you breathe in count, in your mind, from 1 to 12. Now close the right nostril with the ring finger, so that both nostrils are firmly closed. Keep the right nostril closed with the thumb and open the left nostril with the index finger. Smoothly and softly breathe out through the left nostril. Breathe quietly and gently. Practice five rounds for the first month. present moment. It develops the virtue of patience. The breath is the object of concentration. Relax the breathing, allowing the body to breathe naturally on its own. Become aware of the nose and observe the sensation of breath as it comes in and out. Do not try to control it, just observe it. Let each breath remind you to stay centred and present in the now. Be in the present moment with the breath. Now begin counting the breaths backwards from 50 down to 20. Observe the breath as it passes through the nostrils and simply count. If you catch the mind drifting away from the counting, gently bring it back. When you reach 20 start counting only when you exhale. Keep counting the breaths until you reach zero. When you reach zero stop counting, but continue to be aware of the breathing. Observe each breath as it goes in, and as it comes out. Continue to observe the breath as it passes through the nostrils, but do not count the breaths. Feel the sensation of air as it comes in and pushes out through the nose. Breath to breath, moment to moment. You may find yourself naturally relaxing. Your breathing may become deeper and slower. Allow this process to take place naturally. Continue breathing attentively for a few minutes or longer. and awareness of the crown chakra. Maintaining stillness of the water is the object of concentration. Keep absolutely still, relaxed and alert. Imagine there is a small bowl balancing on the top of your head. In the bowl is water. Keep the water completely still and without ripples so that the surface is like a mirror. keep the body absolutely still. completely focused on maintaining the stillness of the water. mind busier; but in reality you are becoming aware of how busy the mind actually is. concentration back to the water. Keep the water completely still by not moving or thinking. Now imagine that your mind is like a calm, clear lake, so that the surface is like a mirror. As a cloud drifts past, image the mind reflecting it. As the cloud passes imagine the lake returning to calm clarity. Keep reflecting the clouds that pass, but always return to the clear lake. After a time the clouds clear and the lake reflects the vast blue sky. Stay with the clear lake for a few minutes. cell, every molecule, every particle. Love in the centre of your chest is the object of concentration. Become aware of your heart in the centre of your chest. This is your heart chakra. This is the centre of your love energy. Feel your heart breathing in and out, freely and easily. As you breathe, feel the heart centre expanding and contracting. Do not think about your breaths, or the meaning of love. Simply experience what is there to be experienced. Feel what is happening in the area of your heart. Notice how the movement of breath seems to fan and increase these sensations. This is centre of pure love, kindness and forgiveness. The centre of love for yourself, and for others. Feel this love as a powerful healing energy in the centre of your chest. Stay alert and relaxed, but do not move or change your sitting position. from the centre of your chest is the object of concentration. Feel this loving-kindness as a powerful healing energy in the centre of your chest. The centre of loving-kindness for yourself and others. Acknowledge this powerful centre of pure love and kindness. of your chest is the object of concentration. Pure compassion and love for the helpless and the weak. Feel the desire to help the suffering and the sick people of the world. Feel this compassion in the centre of your chest. May I be health, and happy, may I develop loving-kindness, wisdom, compassion. May they be healthy and happy, may they develop loving-kindness, wisdom, compassion. May they be healthy, may they be happy. May I be healthy, may I be happy. Place the hands on the ground in front of the body and in line with the spine. The palms should be facing the body and the finger tips should be almost touching. Imagine gathering the creative energy into the hands. root chakra at the base of the spine, up through the centre of the spine to the top of head. As the hands are raised breathe in, smooth and slow. At the top of the head open the hands upwards and the arms wide. Imagine a sphere of pure white light surrounding the head. Hold for a few moments and mentally repeat the affirmation. Now place the hands in front of the forehead. As the hands are lowered down the front of the body breathe out, smooth and slow. Imagine the creative energy moving down the centre of the spine, back to the root chakra. Practice this technique 3 times. After the third time lower the hands and completely relax. Experience the energy you are made of. Feel what it is like to be you. Experience yourself as the infinite mind that you are. Experience a renewal of optimism that will clarify your priorities and aspirations. Make a silent prayer according to your own religion or personal belief. Repeat the following 3 times. Rub the palms of the hands together vigorously until they become hot. Place the palms over the eyes without any undue pressure. hands to the eyes. Hold for a few moments. your hands to your eyes and then to your head. Feel the body becoming healthy and strong. Feel the healing energy being transmitted to the mind. Feel the healing energy being transmitted to the soul. Feel the divinity awakening in the soul. Feel your whole being connected with the universe. Feel love all around, inside and out. Feel inner peace and happiness. Then open your eyes and slowly lower the hands down the face, letting the light in slowly. Feel the healing energy circulating around the whole body, healing all sickness and pain. Feel stronger, healthier, happy and content. Observe this feeling for a few moments. so that throughout the ups and downs of daily life, we spontaneously create peace and harmony. The following are certain practical points regarding the basic techniques of meditation. professional medical advice before practicing meditation. incorporate the natural flow and cycles of the universe. quickly when a regular time and place have been established. purity of the atmosphere will be felt. Begin practicing meditation for 15 minutes and increasing until you are able to sit for one hour undistracted. 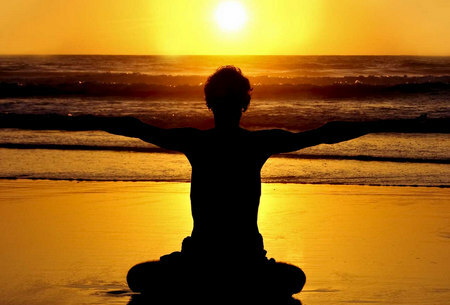 It is recommended to practice sitting meditation twice per day, at sunrise and at sunset. be exchanged for your personal mantra. though you are watching a movie. It will gradually slow down. our relationships with others, our behavior, our health, our breathing and our meditation. heart, new sensations, new feelings, new mode of thinking and acting and a new view of the universe. higher consciousness, use your intuition and live a more meaningful life. union of creative energy with pure consciousness, resulting in complete absorption with the Divine.